Romeo participated in a youth rodeo this past weekend and placed 1st, 2nd and 4th in a few competitions. The competition was pretty good but in the end Romeo and his rider were apparently better in the mud (it rained one day). Of course the ribbons go with the rider but we’re proud of both the rider and our appaloosa. It’s neat having a horse already trained for barrels and poles. Now we just need to train his new rider (I’m working on it)! 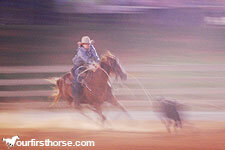 Okay, so how many of you do the rodeo shows or barrels or pole bending? If not, do you want to? I haven’t seen any “gymkana” events here in east Tennessee but I know Laura out in Colorado has been active in that this year. She’s even been on a cattle drive!